Danielle grew up in Plymouth, Massachusetts. 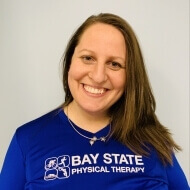 She graduated from Northeastern University with her Doctorate of Physical Therapy after receiving her B.S. in Movement Science and Sport Leisure Studies with a concentration in Sports Medicine from Westfield University. Danielle loves working with a diverse array of patients of all ages and from all walks of life. One of her most enriching professional experiences stems from a two-week trip to Ecuador, where she partnered with several orphanages, to teach aquatic therapy and techniques in early childhood development. Her clinical experiences include inpatient and outpatient orthopedics where she has served patients with all kinds of diagnoses. Danielle practices active listening when working with her patients and takes pride in incorporating their needs into treatment plans. When not at work, Danielle stays active and loves to cook, ski, and watch the Patriots.